A lot of medical experts and marriage counsellors advise that couples who are about to get married should go for specific medical tests before tying the knot. While this is very important, many couples don’t heed this advice for fear of probably incompatible results, especially as regards their haemoglobin genotype, emerging to become a reason for not getting married after such a long and deep emotional investment into each other (it can be very heart-breaking and some people might go into depression that would require psychiatric care if they’re compelled to cut off the relationship and marriage after such a long time of planning about their future together). Instead of waiting till you meet that special half with whom you will spend your lifetime before realizing the importance of such specific medical tests, why not go for these medical tests now that you’re probably single or have not met that special someone yet? 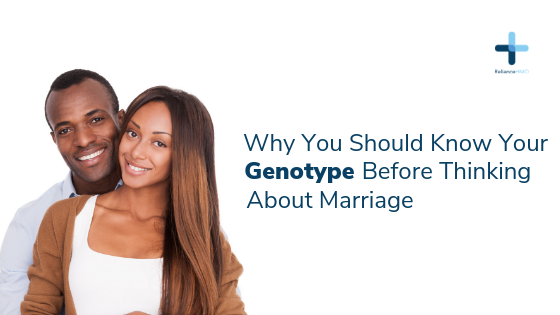 Whether you’re a man or woman, you should undergo a haemoglobin genotype test now before you meet your lifetime partner when it might either be too late or the outcome of your incompatibility could drive you into a mental breakdown. There are several disease variants of the haemoglobin gene, but the commonest ones are haemoglobin S and C. The normal haemoglobin gene present in adult humans is A which exist as AA. However, some people have the A and S pairing as AS; some have the S and another S pairing as SS which is known as sickle cell disease; and a few people have S and C pairing to form SC which is also as bad as SS. If your haemoglobin genotype test comes out as AS, SS or SC, it means you can give birth to a child with SS if you marry someone who is AS or SS. For instance, if a man with AS marries a woman with AS, one in every 4 children they have will be SS. But that’s probability in theory. In reality that one child could be the first child; and that one child in every 4 children could manifest as 4 children in every 16 children, meaning the first 4 children can be SS and the couple has to give birth to more than 10 children to stand a chance of having a child who is either AA or AS. Taking care of a child who is SS can be a nightmare especially for couples who don’t have the financial capacity; and even for those with the financial resources, the child may still die from a crisis or complication that can occur when nobody expects it. Hence, knowing your haemoglobin genotype before entering a relationship that could lead to marriage will enable you talk about it with your partner, and if you’re incompatible, the possibility of marriage can easily be ruled out at this early stage of the relationship, unlike when you’re getting to know your haemoglobin genotype after proposal and the wedding is a few weeks away.